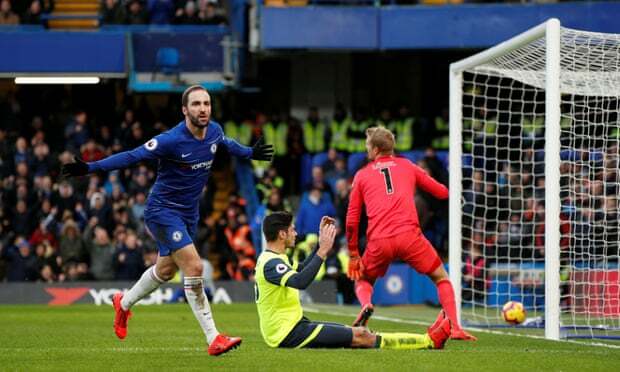 Gonzalo Higuain scored his first Chelsea goals and Eden Hazard struck twice as the Blues moved back into the top four with a dominant victory over Huddersfield at Stamford Bridge. The win ended a troubled week for Blues boss Maurizio Sarri, following Wednesday's 4-0 defeat by Bournemouth - their heaviest league defeat in 23 years. Higuain, who signed on loan from Juventus in the January transfer, opened the scoring in the 16th minute.N'Golo Kante played in Higuain with a delightful reverse pass to beat the offside trap and the Argentine striker finished first time, lashing his shot in at the near post. Just before half-time Elias Kachunga nudged Cesar Azpilicueta over and referee Paul Tierney awarded a penalty, although replays suggested the foul may have occurred outside the penalty area. Eden Hazard stepped up to smash in the penalty and score his first league goal since 26 December. The Belgium international made it 3-0 on 66 minutes, rounding Terriers keeper Jonas Lossl and slotting in from a tight angle. And just three minutes later Higuain got his second, curling in a shot from the edge of the area, with the help of a deflection.David Luiz added a fifth in the closing minutes, with a powerful header from a corner that was deflected into his own net by Kachunga.